My immediate reaction is “Oh no, a feral … we can’t help”, but I phone the lady back and it becomes apparent that the cat isn’t feral. The lady says that the cat is sat outside on top of the bin. I drive to Wythenshawe, not sure whether I’ll be able to catch the cat and wondering whether it is indeed pregnant – I’ve been called out on a previous occasion only to find that the pregnant female was in fact a rather overweight, very indignant male cat! Sure enough, there’s the little cat, still sat on the bin, and definitely pregnant. Before she knows it I’ve scooped her up and put her in the cat carrier – phew, it’s not always that simple! Then it’s a quick ‘phone call to Sue who’s one of our nursery fosterers …..
“Well how about now? She’s in the car! !” I like to keep our fosterers on their toes!! It's Friday evening and Pat phones about a pregnant cat - I have a whole 15 minutes to get the room ready, water, litter tray, bedding and the usual pregnant cat paraphernalia!! A tiny calico cat arrives meowing and immediately wants lots of fuss and attention. She looks no more than a kitten herself. Pat and I decide we're going to call her (little orphan) Annie. Perfect! Annie settles in quickly and never stops purring for a second. Fellow fosterer June, and Judy, Pat, and I all pretty much agree that we don't think the kittens are imminent …. what do we know?? Sunday’s a pretty normal day. I notice though that Annie meows a lot when I leave the room. As I go out in the evening I watch her at the window, crying as I walk away. When I get back she seems so pleased to see me but every time I leave the room she cries. I think “to hell with it”, and curl up in bed with her, hoping desperately that the flea treatment has worked! Yes, they ALL come with fleas, sadly. At about 3:30 a.m. I hear Annie in her litter tray and she jumps up on the bed and snuggles into me. I put my arm round her ready to go back to sleep and that's when I feel her push! I fly downstairs to get the birthing box, rubber gloves and pen and paper (you need to count placenta and I always record the time of each kitten's birth). The first one arrives at 3:55, very small and all black; the second at 4:25 - black and white, then a ginger at 4:52 (note the precision timing!) both heart-stoppingly small. As Annie’s so tiny I think that must be it, but no! At 5:10 another black kitten arrives. That's got to be it, so I go downstairs and make a quick coffee (although I don’t need much help to keep awake as the adrenaline’s flowing!) At 5:50 another kitten is born. This one isn't moving. Annie's exhausted so I break its sack and there it is - a tiny, perfectly formed, black kitten. I can see its claws and little whiskers but it’s not breathing! Forgetting everything you probably should do, I blow on it, rub it, and swing it up and down (all the time cupped in my hands!). I put it down and blow again and this time it takes a breath. I can see its chest moving up and down but the little kitten remains motionless for 10 minutes before it starts to move. I can't begin to describe how that feels! Suffice to say there’s a great deal of blubbing on my part! He or she will obviously have a special place in my heart but I will never know which one it really is because there are three identical, completely black kittens. No matter, I love them all. After making sure they’re all feeding, tidying up and feeding Annie it’s 7-30 a.m. Time to let Judy know, have another coffee, and tell my fostering friends the surprise news. Time to relax. But no, Annie starts to pant - never a good sign in a cat. Judy arrives and we decide on a vet check. I load Annie and the newborns into the car. It’s a good call - Annie has a high temperature so she's given antibiotics and painkillers. It’s 1 o’clock and I can finally sit down and have a sleep. What a roller coaster the last 10 hours has been! Sleeping in the same room???? Now that IS dedication! On occasion I temporarily take in pregnant cats whilst I decide which of our fosterers is free (sometimes it means some juggling about! ), and on the last couple of occasions I have completely missed the birth! Last year I took Candy in, and whilst I watched Football Focus on a Saturday morning she gave birth to six kittens! Everything completely cleaned up and kittens feeding by the time I went in to put her in the basket and take her to one of our fosterers! The day after Annie came in there was another phone call – this time about some kittens under a hedge. I went to look at them but they were several weeks old, completely feral and could not be handled. There was also a pregnant feral cat and thankfully Abandoned Animals stepped in to help. With our very limited resources we’re unable to take in and attempt to socialise kittens which are more than a couple of weeks old. Occasionally we can successfully socialise and home kittens which have been born outside but it is ESSENTIAL that we are alerted when the mother cat is pregnant or when the kittens are at the most a few days old. A week later I had a call from one of our supporters about a gentleman in Partington who was looking after a very young and rather pregnant cat in his garden. When I went to have a look, the gentleman had been kind and had made a shelter for the cat, but it was inadequate. The little cat who was full of fleas (of course!) looked very heavily pregnant, and I brought her back to my house before taking her to our nursery fosterers, June & Peter. June named her “Kally” - she’s a very young tabby & white girl, far too young to have a boyfriend, never mind to get up to the things that she’d obviously gotten up to!! Kally was checked over by a vet who said she was ready to give birth “any time”. She was so big! During her time at June’s she just seemed to get even bigger and bigger, and we were all convinced that there would be more kittens before June & Peter went on holiday. But Kally had other plans, and after a couple of weeks Kally had to be transferred to fosterers Sharon & Steve. I’m not sure how excited they were at the prospect of a mum and kittens again, especially after a run of fostering adult cats which tend to be much easier! 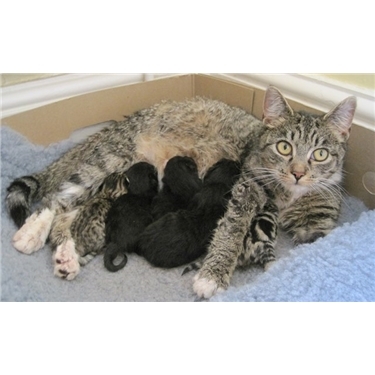 Kally’s kittens were born on 3rd July – one day short of 4 weeks since I collected her from that garden! Here’s Sharon with Kally’s tale ……. Oh my goodness!! I’ve never seen such a young cat looking so pregnant! Kally looks so strange – she’s very petite with beautiful green eyes which seem far too big for her tiny face, and with a very swollen belly almost the size of a football! There must be lots of kittens in there, and surely she’s about to give birth imminently? But what do I know; I’ve never fostered a pregnant cat before! Everyone agrees though that she can’t have much longer to go, and I set about reading up on birthing, and follow Sue’s advice by getting everything ready in The Kitten Room! I prepare different beds and birthing boxes so that Kally has plenty of choice when the time comes. June gives me a heat-retaining pad so that the kittens will be kept warm, and Sue comes round with the essential rubber gloves to have at the ready! Guess who’s been watching “Call The Midwife” …. thanks ladies! Twice I’m convinced that she’s going to give birth in the night and so I end up taking a duvet into The Kitten Room and sleeping on the floor. Steve didn’t miss me, Pat thinks I’m crackers and I probably am, but I’ve never seen a cat giving birth before and I don’t want to miss it. I’m also a little worried about Kally, wondering how on earth she’s going to cope – what if there are complications? Every day I’m getting text messages asking if there’s any news. I’m sorry to have to disappoint! Then finally, late afternoon on 2nd July, almost four weeks since Pat collected Kally (you mean she was only five weeks pregnant when she first arrived???) Kally starts to show signs of the early stages of labour. She’s very restless and has a mucous discharge …. This is it! “No it’s OK, just wake me if you need help”. Coward! Kally’s contractions start at about 1:00 a.m. on 3rd July. She seems in quite a bit of distress (not what it says in the book!) and is crying loudly. She keeps going to the litter tray and straining. “Oh crikey, please don’t have your kittens in there” I’m thinking! The first kitten starts to appear at 2:10 a.m. whilst Kally’s in the litter tray in quite a lot of pain. I quickly lift her up and put her in the birthing box. It takes another 10 minutes before the kitten’s fully out. At first it doesn’t look like it’s moving and I try to remember what I’m supposed to do, but Kally sorts it out herself, breaks the sack and starts to clean it up. Over the next two hours, three more kittens follow. There are a few scary moments when Kally doesn’t automatically chew through the umbilical cords and the kittens are left dangling from her and swinging about. Am I supposed to tie them off? Thankfully Kally’s chewed through the cords whilst I’m still thinking about what to do! I hear Steve get up – he has to be out very early for work - and I give him the news. He’s slept through it all! Just as well – I’m sure he’d have fainted! Things then take a bit of a dramatic turn (as if I hadn’t had enough drama already!) as Kally has something stuck half in and half out – it looks like placenta but I can’t be sure. She’s been pushing for ages and it won’t budge. The general consensus after texting June and Sue (sorry ladies, I know it was very early!) is to get Kally to the emergency vets, so I ring ahead to alert them, and I ring Judy and leave a message. I’m en route when Sue insists on coming with me (June had already offered but I told her I’d be fine) so I make a quick detour to get her. After finally arriving at the emergency vets in Worsley (we hit all the rush hour traffic) I’m frustrated at the inordinate amount of time that the receptionist is taking to book us in, and am in total disbelief when I’m asked if the cat is male or female! Finally a vet sees Kally and we’re told that there are more kittens inside and we should wait there for the next hour to see if Kally can expel the placenta on her own. We wait and wait, poor Kally’s obviously distressed. Then just before the hour’s up Kally manages a huge push and out comes the placenta and something else – I break the sack and it’s a kitten but it has no fur and isn’t fully formed. The vet examines Kally and thinks that there are still more kittens inside. He says that there are no blockages and we can take her home to give birth to the remaining kittens. As Sue puts Kally in the car Kally starts with more contractions and gives birth to another unformed kitten. We get back home as fast as we can (it’s now around 9:45 a.m.), put Kally and her four kittens back in the birthing box and then whilst Sue makes us a VERY strong coffee I ring Judy with an update, and ring June to ask if she’d like to come and see mum and kittens. Just as June arrives, Kally becomes very restless and starts with contractions again! This time a kitten appears feet first, and it’s obvious that Kally is exhausted and can’t get it out. We all have a go at trying to pull it in time with the contractions but it’s well and truly stuck, and Kally’s in pain. Kally and kittens are put in the carrier again and we make a dash to the local vets this time. June’s rang ahead and although vet Chad’s operating, he meets us when we arrive. Chad, with vet nurse Kim’s help manages to pull out the last kitten which was much bigger than the others and sadly stillborn. What an ordeal for everyone involved and for poor Kally, and a real baptism of fire for me! I was in a bit of a daze for the rest of the day not having slept for over 24 hours, and I too have to admit to blubbing once it was all over and the adrenaline had worn off! It’s sad that three kittens didn’t make it, but that’s nature. No wonder poor Kally was so big carrying seven of them! The four kittens that did make it – Kit-Kat, Keith, Kimmy & Kenneth – are all doing really well, and Kally’s turned out to be a fantastic mum despite being little more than a baby herself!! Thursday 12th June and yet another ‘phone call from someone about a pregnant cat. But we were now full to bursting and so I explained that we could help with advice, or they could try to see if another rescue centre or shelter could take her in. Judy wins ….. a ‘phone call to Sue (remember – she already has Annie and her five kittens!) … could she double up and possible use her spare bedroom? Of course she can! So I call the man back and I leave 3 messages. There’s no response from him. I wonder if Judy has given me the right number. A woman has also ‘phoned regarding the same cat, so I ring her and leave a message. She rings back at 00:45 a.m.!! Thinking it’s an emergency I rush downstairs and pick up the ‘phone. Somehow the story doesn’t ring true … the man who ‘phoned (her partner?) is a single parent with 4 children, and she has 2 large Alsatians. She said that they know the owners of the cat and had carried it round to them but the “owners” had denied it was theirs. The woman said she was worried because that the cat kept hanging around and wouldn’t go away from the back door, so she was thinking of taking her Alsatians to her mother’s (at 00:45 a.m.?) and putting the cat in her bedroom. Are you following??! I agreed to go round the next morning. When I arrived there was no sign of any children or that there were any dogs living there. The couple said that their kids had called the cat Twinkle, and that they had felt the kittens move when the cat was lying on their knee. Hang on – hadn’t the woman said that the cat kept hanging round outside and wouldn’t go away from the back door? Well, guess what ….. the cat WAS theirs! Judy checked her records and she had received a call from the couple back in January wanting us to neuter two cats, one of which was called Twinkle. Judy sent them two neutering vouchers but obviously it was too much trouble for them to get off their backsides and to take the cats to the vets - and now one of the poor cats was pregnant. I do wonder about the second cat – there was no sign or mention of him. Anyway, I collected the cat and took her to Sue’s who had prepared her spare bedroom. Back to Sue for “Zoë’s tale” ……..
And so Zoë arrives, with fleas, of course. A beautiful, tortie and white young cat. She's lovely but scared, and a burrower. She burrows straight under the cat bed. Although she'll come out whilst I’m there, whenever I leave she’ll burrow under anything even the mattress. Bear in mind this is during our mini heat wave! Judy arrives and we decide that we need to get everything off the bed, including the mattress, as we can't risk her giving birth under anything. Everything is moved into another bedroom and later Judy returns with at least 6 cat beds of every shape and size. I can set up shop! Meanwhile my remaining bedroom is a complete tip! Zoë gains confidence but refuses point blank to use any of the cat beds, preferring instead to sleep on the floor. On Monday we go for a vet check. Zoë’s pronounced fit and healthy. The vet says kittens should arrive within two weeks but if he has to put money on it, five days. On Friday at 3:00 a.m., exactly five days later, my own cat James wakes me by meowing, standing on top of me, and stropping, which I ignore. He then proceeds to knock everything off the bedside table. I give him a fuss and think I might as well check on Zoë. I go in and am shocked to see that Zippy has already been born but is tangled in a sheet which Zoë has burrowed under. He’s still attached to the placenta! I scoop him into the nest and Zoë begins to clean him up and eat the placenta. Two more kittens follow - Zara and Zebedee. All small but they seem well. Thank you, James! Later, Zoë begins panting and we go to the vet - she has a very high temperature and needs antibiotics and an anti-inflammatory. They do the trick and Zoë gradually settles into looking after her newborns. Everything seems to be going well and once again I can relax! On Sunday afternoon one of the fosterers, Sharon (who has Kally & Co), calls round to see the new arrivals, just as tiny Zebedee starts struggling to breathe. Although we do everything we can think of it’s to no avail and poor Zebedee dies in Sharon’s hands. This is the first foster kitten I have ever lost and it’s overwhelming to realise how much I loved him, even though I had only known him for 36 hours. We let Zoë say goodbye to him, then we gently wrap him up – he’s so very tiny and fragile – and we bury him in the garden. June’s going to find me a nice plant to brighten his place. I’ll think of him every time that I look at it. Fostering is simply amazing but sometimes it can be devastating. Thankfully the highs outweigh the lows, and I’m looking forward to seeing Zippy & Zara growing up in the coming weeks. So there you go! The ups and downs, the highs and the lows, the wonder and the sadness. It hits all of us in our small group. We fall head-over-heel in love with them all, and fostering is one of the most rewarding experiences you can have! And then it’s back over to me to find homes for all of them – the best home possible, as everyone here knows, because over the years YOU have given one or more of our precious cats that special home. THANK YOU!